Think it's too late for you? Pshaw. 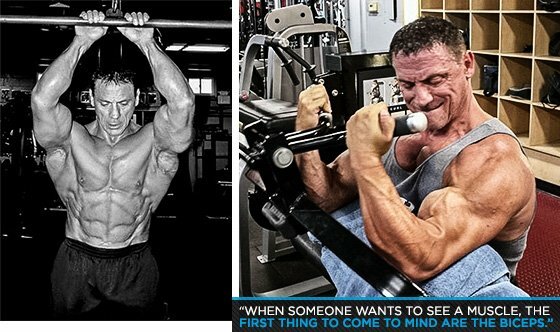 IFBB Pro Joe Palumbo soared past the half-century mark with a set of guns that make young men weep. Try his back and biceps workout! A lot of people would have you believe that once you leave your 30s behind, it's all downhill. You can blame our society's obsession with professional sports like baseball, football, and basketball, where the stats tell a story of an early peak followed by a long, lingering decline—also known as the rest of your life. Sooner than you expect, the thinking goes, "great shape" will be a memory, but definitely not a reasonable goal. Joe has been a devotee of bodybuilding since he first saw a picture of Arnold at age 11, so he has four decades of accumulated experience and wisdom spotting him every time he steps into the weight room. The result is a sensible, efficient four-day split built around proven exercises. Keep reading if you believe this, because Officer Joe Palumbo is about to raid your pity party with the full force of the law. 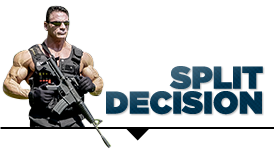 Palumbo is an IFBB pro competitor who also serves as a member of an elite SWAT Team in New York. He's got a physique that's harder than stone, complete with arms that any college bro would covet. And he's 52 years old. True, Palumbo started training young, but he didn't earn his pro card until he won the Masters Nationals at the age of 41—the same year he was voted "Police Officer of the Year." This bodybuilder doesn't cut any corners or put up with any excuses. How can Palumbo work a full-time job, eat properly, and train at an elite level? That's what's so great about bodybuilding: Everything is possible if you're driven and focused on your goals. "This sport has no age limit," Palumbo says. "Having the right training, nutrition, and supplement geared for a specific goal is the key." Even someone as busy as Palumbo knows that a rushed workout only cheats the person performing it. Here's the philosophy he applies to the back thrash part of his "pull" day. "Before I train, I stretch out the muscles I plan on working so they are loose and ready for the stress I plan on putting on them. I start with a pull-down movement to stretch out the scapulas. Then I want to improve my thickness, so I move to rowing movements. Finally, I finish with hyperextensions for the lower back." Nor do biceps receive any mercy. "When someone wants to see a muscle, the first thing to come to mind is the biceps," he says. "Obviously barbell curls are the most popular exercise, and I start with those. Preacher curls, or 'Scott' curls, named after the first Mr. Olympia Larry Scott, come next. Make sure you don't bounce the weight and you take time with the exercise. I like to isolate each arm with concentration curls. Finally, standing cable curls will do nicely to finish off the biceps, since they keep constant tension on the muscle." Officer Palumbo also hits abs with three moves for good measure. Palumbo's line of work dictates that he must be ready to perform at the highest level at the drop of a hat. He knows that consistent nutrition is crucial to his training and livelihood, so he lets nothing stop him from eating right. This is no small feat when eating 6-8 meals every day. "I plan ahead for such an unpredictable schedule," Palumbo says. "My meals and supplements are planned for the day the night before, and I always keep an extra stash of Infinite Labs protein for those unpredictable moments. The key is to plan ahead." Aside from the undeniable value of having a shake ready in a pinch, Palumbo's lifetime of hard work makes him keenly aware how targeted supplementation can help support the things a younger man might overlook—like sleep. He utilizes both Infinite Labs' GABA and melatonin blend Cyclo Rem, and the ZMA product Pro Z, to take full advantage of his precious downtime. He also keeps an eye to his testosterone level to keep him feeling and looking his best. "My supplement plan supports me at my age, my career, and my training," he says. "Anyone over the age of 35 needs their testosterone to function at a normal level, whether they admit it or not. Age is an important factor in considering which supplements to take to enhance every aspect of life—whether they are in the fitness industry, working a full-time job, or in my case, both."